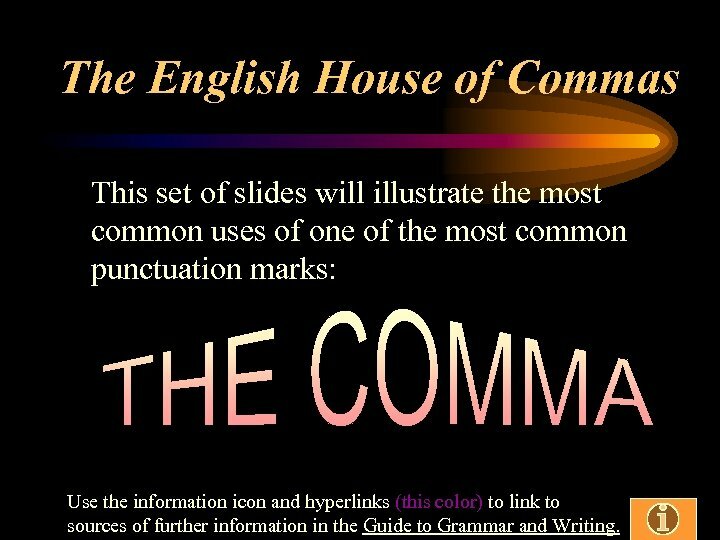 The English House of Commas This set of slides will illustrate the most common uses of one of the most common punctuation marks: Use the information icon and hyperlinks (this color) to link to sources of further information in the Guide to Grammar and Writing. 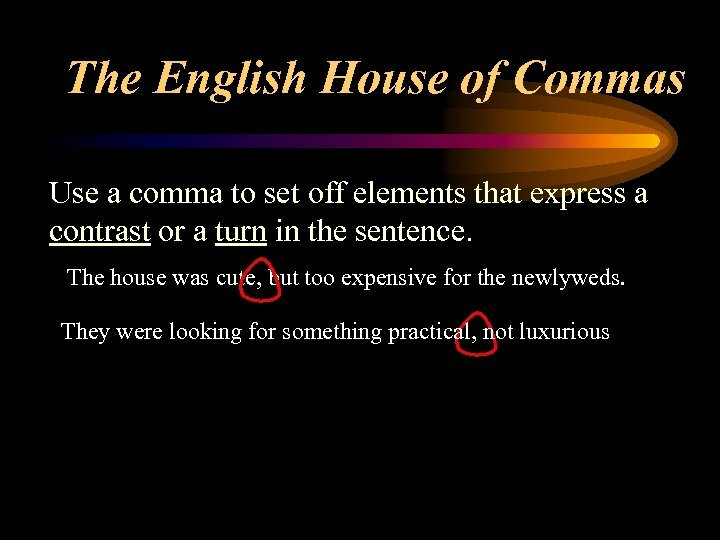 The English House of Commas Use a comma to set off the elements of a series (three or more things), including the last two. My favorite uses of the Internet are sending e-mail, surfing the Web, and using chat rooms. You may have learned that this comma is not necessary. 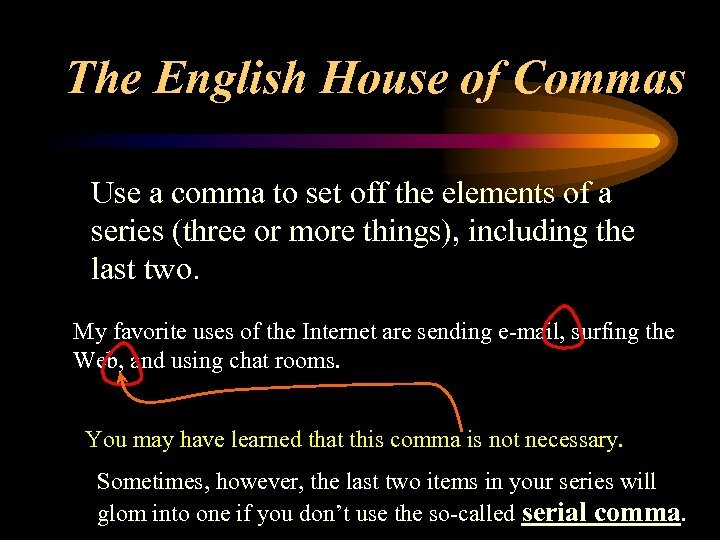 Sometimes, however, the last two items in your series will glom into one if you don’t use the so-called serial comma. 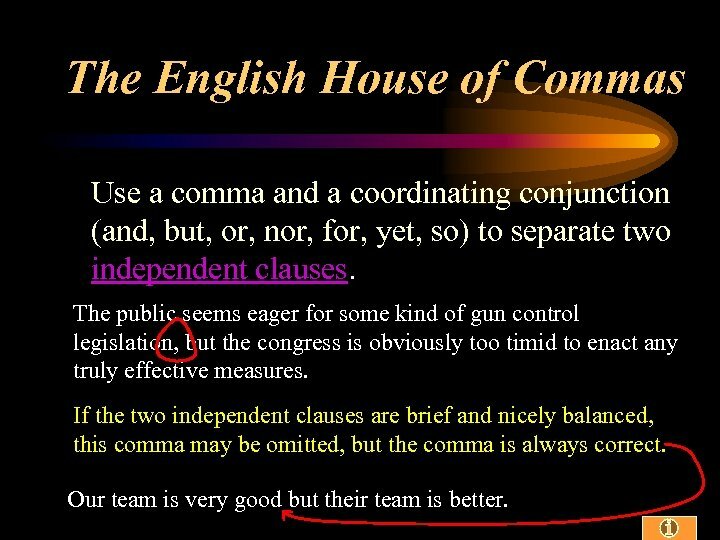 The English House of Commas Use a comma and a coordinating conjunction (and, but, or, nor, for, yet, so) to separate two independent clauses. The public seems eager for some kind of gun control legislation, but the congress is obviously too timid to enact any truly effective measures. If the two independent clauses are brief and nicely balanced, this comma may be omitted, but the comma is always correct. Our team is very good but their team is better. 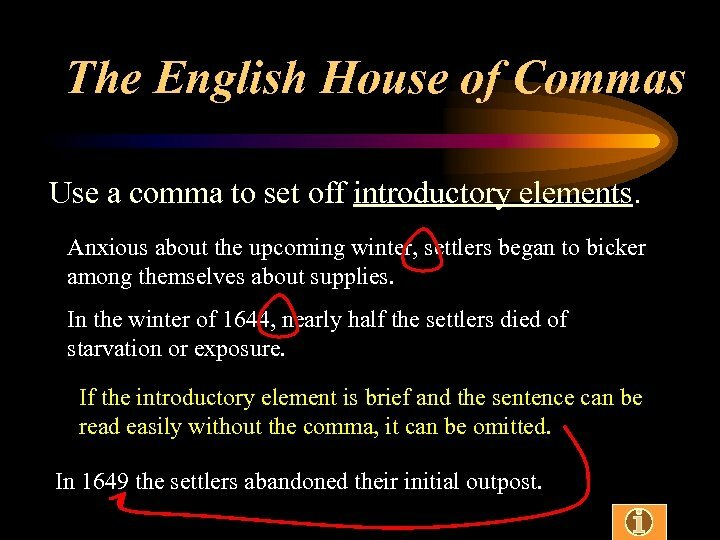 The English House of Commas Use a comma to set off introductory elements. Anxious about the upcoming winter, settlers began to bicker among themselves about supplies. In the winter of 1644, nearly half the settlers died of starvation or exposure. If the introductory element is brief and the sentence can be read easily without the comma, it can be omitted. In 1649 the settlers abandoned their initial outpost. 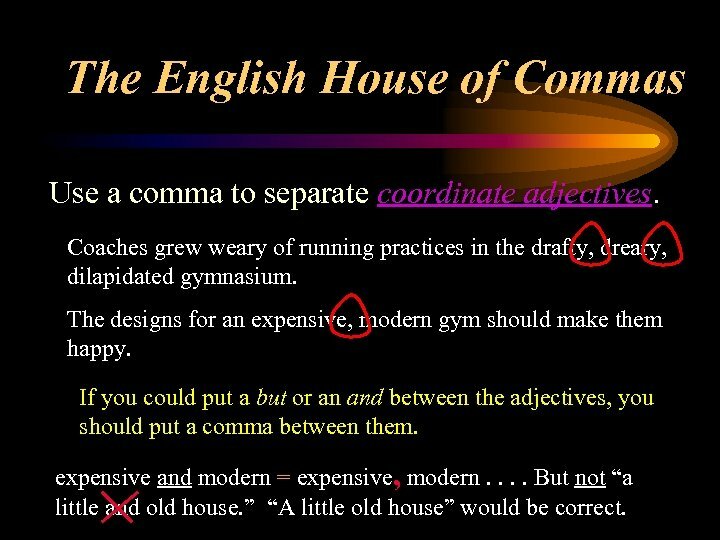 The English House of Commas Use a comma to separate coordinate adjectives. Coaches grew weary of running practices in the drafty, dreary, dilapidated gymnasium. The designs for an expensive, modern gym should make them happy. If you could put a but or an and between the adjectives, you should put a comma between them. expensive and modern = expensive, modern. . But not “a little and old house. ” “A little old house” would be correct. 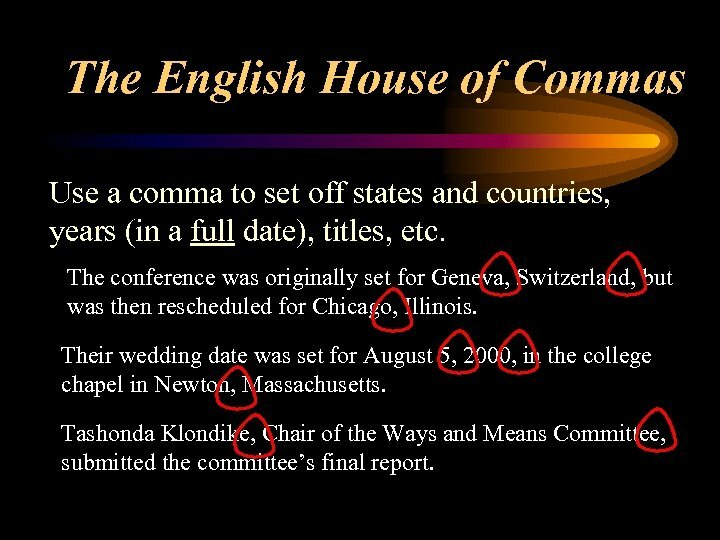 The English House of Commas Use a comma to set off states and countries, years (in a full date), titles, etc. The conference was originally set for Geneva, Switzerland, but was then rescheduled for Chicago, Illinois. Their wedding date was set for August 5, 2000, in the college chapel in Newton, Massachusetts. Tashonda Klondike, Chair of the Ways and Means Committee, submitted the committee’s final report. 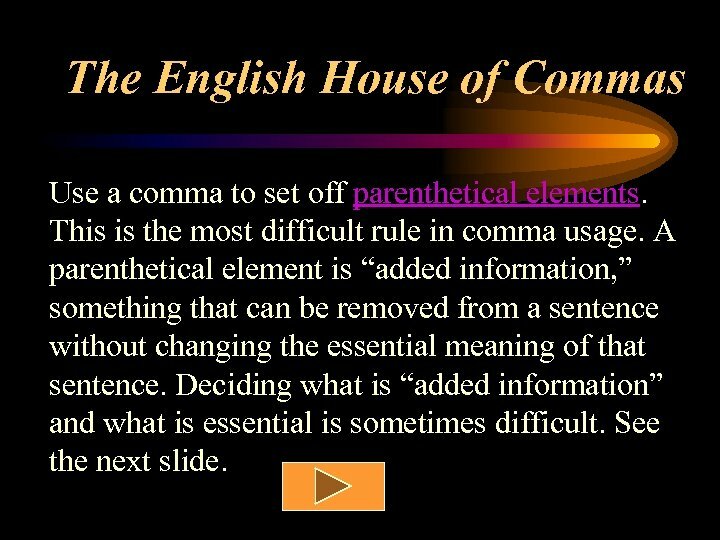 The English House of Commas Use a comma to set off parenthetical elements. This is the most difficult rule in comma usage. A parenthetical element is “added information, ” something that can be removed from a sentence without changing the essential meaning of that sentence. Deciding what is “added information” and what is essential is sometimes difficult. 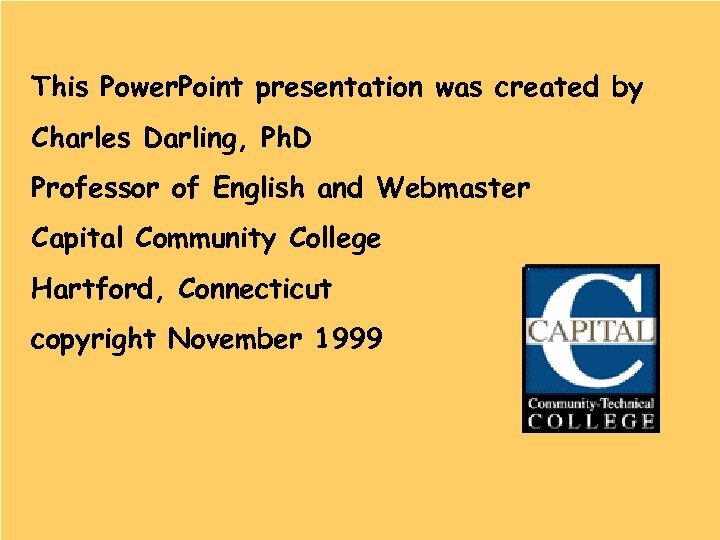 See the next slide. 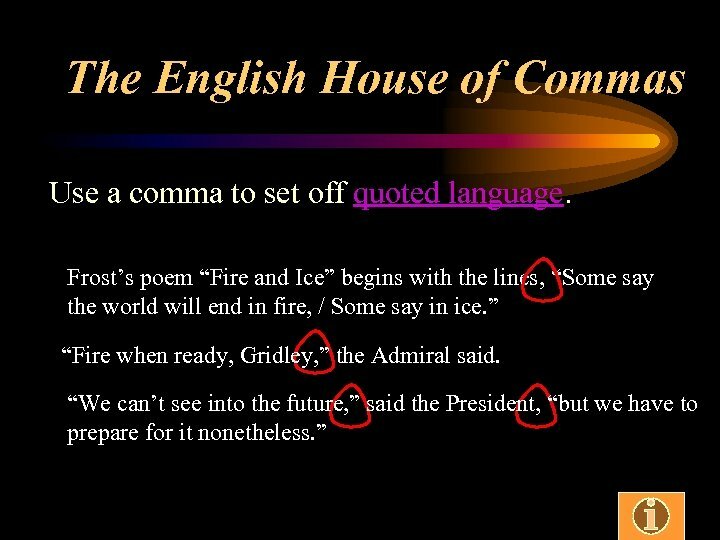 The English House of Commas Parenthetical elements: When an appositive phrase can be removed from a sentence without changing its meaning or making it ambiguous: Robert Frost, perhaps America’s most beloved poet, died when he was 88. An absolute phrase is treated as a parenthetical element: Frankly, it doesn’t seem to matter. 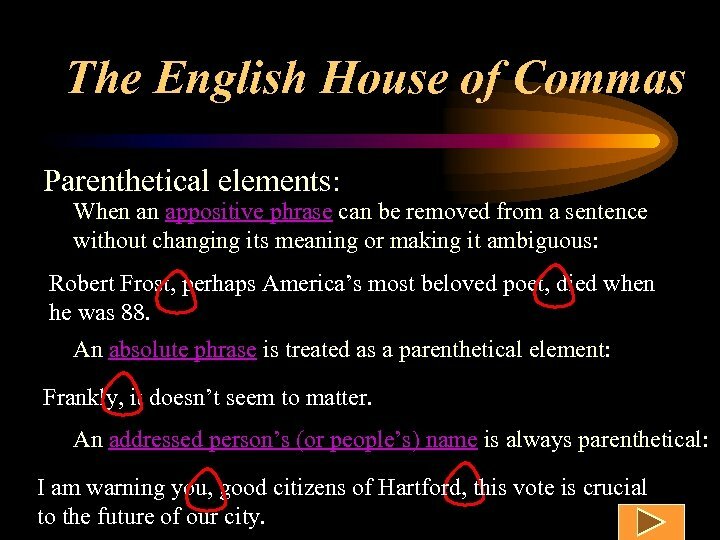 An addressed person’s (or people’s) name is always parenthetical: I am warning you, good citizens of Hartford, this vote is crucial to the future of our city. 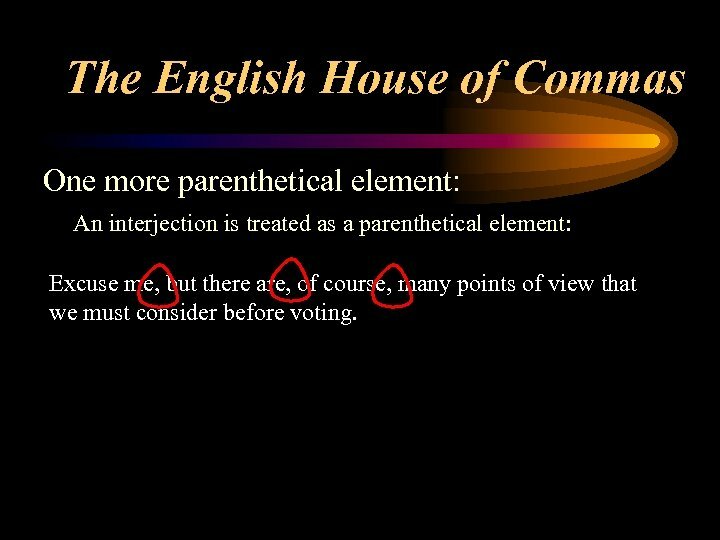 The English House of Commas One more parenthetical element: An interjection is treated as a parenthetical element: Excuse me, but there are, of course, many points of view that we must consider before voting. 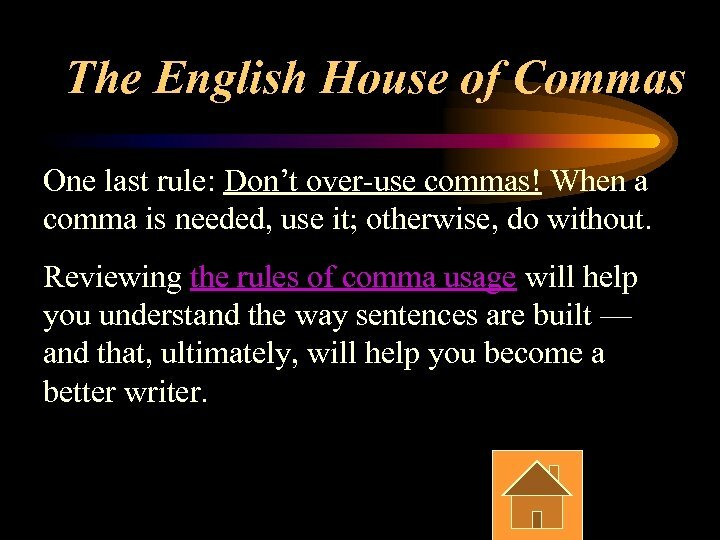 The English House of Commas One last rule: Don’t over-use commas! When a comma is needed, use it; otherwise, do without. Reviewing the rules of comma usage will help you understand the way sentences are built — and that, ultimately, will help you become a better writer.